Tropical Storm Harvey has been downgraded to a tropical depression but not before creating a new weather record in the United States. Climatologists say Harvey is the worst rainfall event ever with 1318 mm (51.88 inches) of rain recorded at Cedar Bayou, Texas beating the previous mark of 1219 mm (48 inches) in Medina, Texas from Tropical Storm Amelia in 1978. Thousands of residents could still be stranded and an estimated 40,000 homes have been destroyed by the storm in the Houston area. Heavy rain is now moving over Louisiana, Mississippi, Arkansas and Tennessee with some areas expecting more than 200 mm. More than 3,500 residents of Houston have been rescued since Tropical Storm Harvey began pounding southeastern Texas with more than 750 mm of rain and counting. Tens of thousands displaced from their homes are being housed at evacuation centres which are now overcapacity forcing many to sleep in chairs or on the floor. 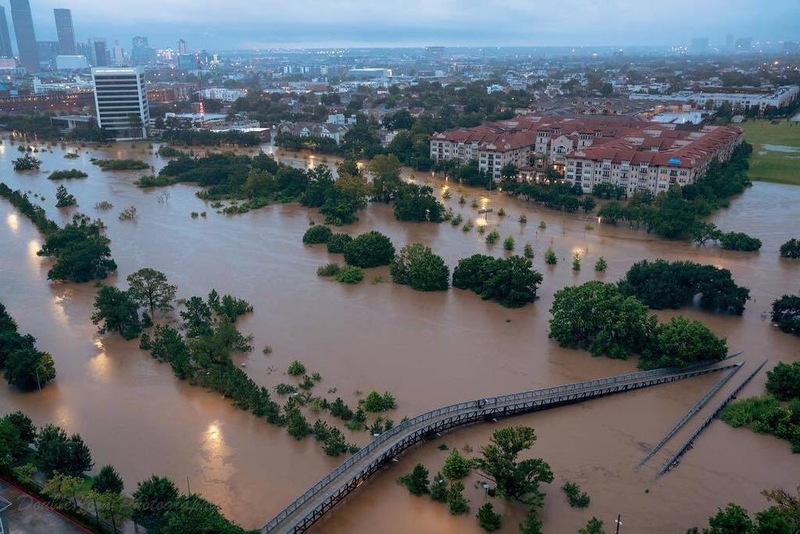 Officials began releasing water from two Houston reservoirs on Monday in order to prevent uncontrollable flooding in the downtown area. Houston’s two main airports have been closed since their runways are completely underwater. The Texas Gulf Coast is a key centre of the American oil and gas industry with some of the largest refineries in the United States halting operations. The worst storm to hit Texas in 20 years is expected to reach the state’s Gulf of Mexico coastline by early Saturday. The U.S. National Weather Service warned Harvey could bring a potentially devastating storm surge, up to 900 mm of rain and powerful winds to portions of the state. Harvey will be the first Category 3 hurricane to make landfall in the United States since Hurricane Wilma in 2004. 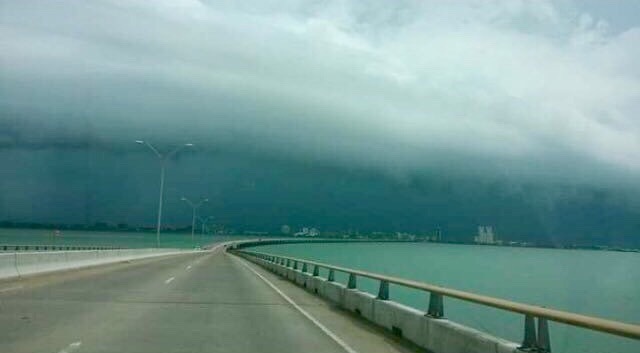 A voluntary evacuation order has been issued for the coastal city of Corpus Christi with a population of more than 500,000 people. During January and February, the city of Chicago only had a few centimetres of snow with no measurable amount on the ground for the first time in 146 years. Record highs were broken from New England to Texas where temperatures recently soared into the high 20’s C causing trees and flowers to bloom ahead of schedule. The cherry blossoms in Washington, DC could reach their peak on 14 March which would be the earliest.since officials began keeping track in 1921. Climatologists say much of the central and eastern United States had a very warm winter with February 2017 being the second warmest in 123 years of records. UPDATE – The cherry blossoms in Washington, DC actually reached their peak on 25 March after being delayed by a cold snap and snow. The North Pole climbs above freezing, deadly tornadoes strike Texas, extreme heat bakes Australia and historic floods hit Britain and the American Midwest – the world is filled with extreme weather as it welcomes 2016. A powerful and destructive North Atlantic low-pressure system brought eastern Canada an unusually warm holiday period, climbing to a spring-like 16°C in Montreal on Christmas Eve. This was followed by heavy snow from Ontario to the Maritimes. In the United States, tornadoes and floods left almost 50 dead. The mighty Mississippi River has already exceeded overflow levels by four metres in some areas. Scientists say the common cause of these events is a strong El Nino, a weather phenomenon which emerges every few years on average. Record rainfall has brought unprecedented flooding to England and Scotland and Britain’s mean December temperature was a record-breaking 8°C, smashing the previous high of 6.9°C set in 1934. With El Nino showing little sign of running out of steam, many scientists say 2016 could be even warmer than 2015. Tropical Storm Bill has dropped a lot of rain over north central Texas and south central Oklahoma after making landfall east of Corpus Christi early Tuesday. 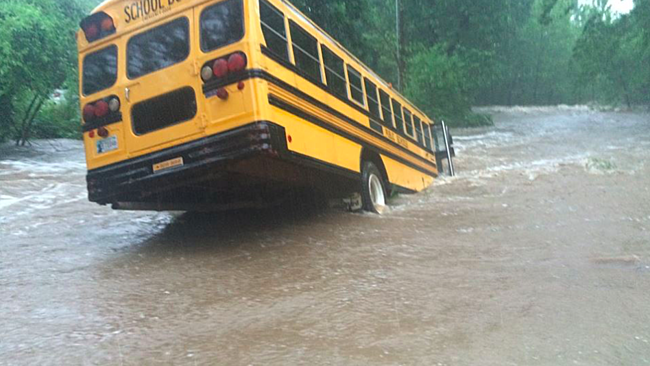 The U.S. National Weather Service reports more than 300 mm (12.5 inches) fell in some areas up to yesterday which caused flooding when creeks and rivers spilled their banks. Before being downgraded to a tropical depression today, strong winds from Bill also brought down trees and power lines with tens of thousands losing electricity. Authorities fear at least 20 have died and many others are missing following torrential rains in Texas which led to flash flooding. 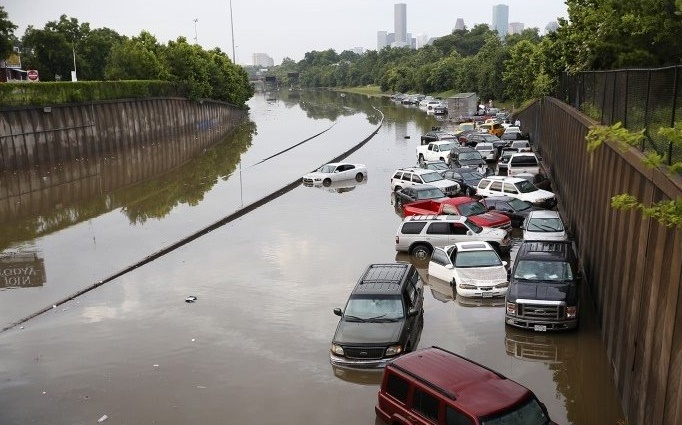 Houston had about one-quarter of its yearly rainfall in less than 24 hours which swamped neighbourhoods and major highways with hundreds of drivers forced to abandon their vehicles. A dam southwest of Dallas is bursting at the seams but officials believe it will hold. Forecasters say more rain is expected over the next few days. All modes of travel were halted over the American South yesterday from Texas to North Carolina thanks to a winter storm that dumped freezing rain and snow on the region. Although most areas received less than 10 cm of snow, the region is not used to wintry weather and some cities don’t even have snow plows or salt trucks. 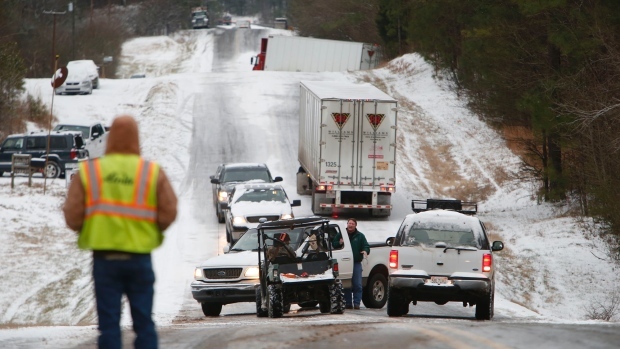 At least five states declared emergencies when motorists were left stranded in their vehicles, students were forced to stay in schools overnight and many others sought shelter in churches and even grocery stores. Icy highways led to hundreds of collisions, many involving tractor trailers which jack-knifed and blocked traffic. The same system is impacting the Maritimes today with less than 5 cm of snow expected in New Brunswick and higher amounts near the Atlantic coast of Nova Scotia. 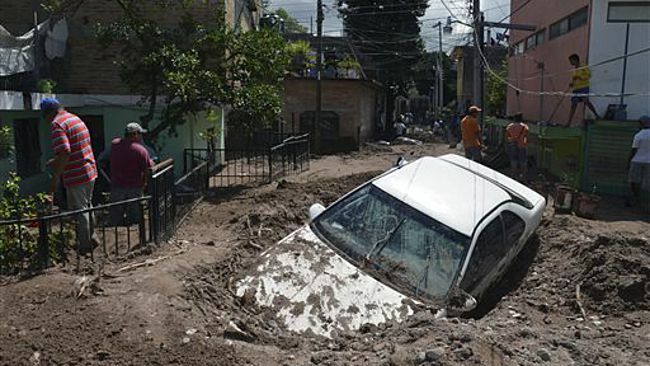 The rare one-two punch from Hurricane Manuel and Hurricane Ingrid have left a death toll of more than 100 people in Mexico according to the Reuters news agency. Manuel has broken down and is now simply a low pressure system heading for Texas, USA which is actually welcome news for the drought-stricken state. However, it brought astounding rainfall amounts of between 200 and 300 mm which caused widespread flooding and mudslides over mountainous terrain. The Pacific coast resort cities of Acapulco and Mazatlan were among the hardest hit regions of the country and the cleanup is now underway. Ingrid began strengthening in the Bay of Campeche after crossing the Yucatan Peninsula and slammed communities along the Gulf of Mexico as a strong tropical storm.